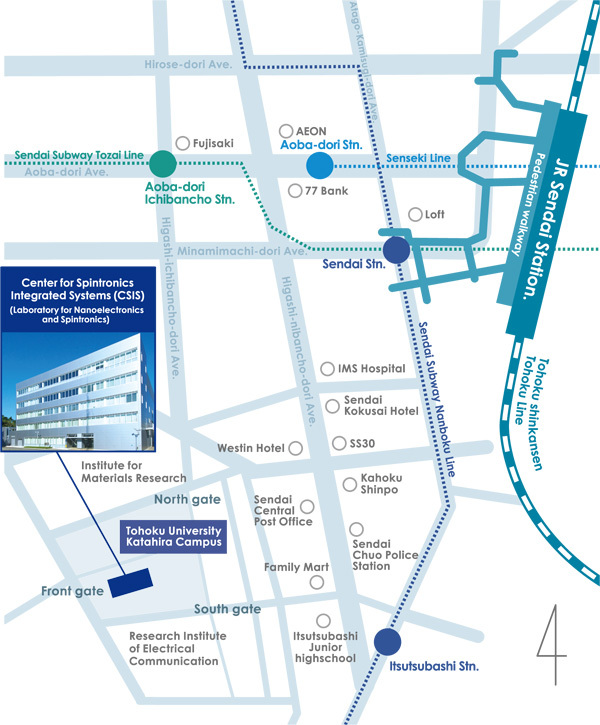 Take the Sendai Airport Access Line from Sendai Airport Station to JR Sendai Station. About 20 minutes from JR Sendai Station west exit. About 5 minutes from JR Sendai Station. Take the subway from Sendai Station to Aobadori Ichibancho Station (2 mins). Exit at South 1. Turn left and walk straight ahead for 550m towards the North gate of Katahira Campus. Take the subway from Sendai Station to Itsutsubashi Station (2 mins). Exit at North 2 or North 4. Turn left and walk straight ahead for 450m towards the South gate of Katahira Campus. Copyright (c) Center for Spintronics Integrated Systems, Tohoku University All Rights Reserved.